before the New Moon for root crops or trees and shrubs would be ideal. I try to plant my seeds by the moon and signs, so next week will be a good time for me to start my leafy greens, tomatoes, some peppers, brassicas, herbs, etc. New moon is Thursday. I started onion seeds last month (after full moon) indoors, and they’re under lights now. They’ll get transplanted into the ground when I get it plowed and tilled, which will prob be within a couple weeks. Corn and cukes will be direct sow in the ground, but the soil’s still too cool for those. Where do you put the antifreeze - the spray tank? Of course, you do, and then you run it through the pump and the spray nozzle. After that, it’s time for hot chocolate because you’ve frittered away yet another autumn day. my sweet cherry might be alive. The buds are looking sort of green. 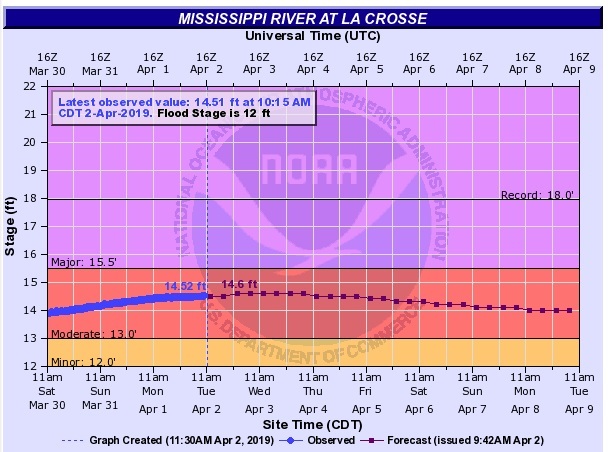 Looks like the Mississippi River crests today in La Crosse… May no look that impressive by this chart, but this is the highest water level since 2001 and will fall in the top 10 of water levels here since they kept records. I do rinse out the sprayer before use the next spring, but I drain it where I always drain it come what may. It soaks in. RV antifreeze is non-toxic. As is the antifreeze used in heating systems. Many (most) automotive antifreezes are still toxic, including the green and orange colored ones. Although as I recall RV antifreeze is cheaper than the auto stuff. Whether it is bad to use automotive antifreeze in your sprayer, really just depends on how you clean it out in the spring. If it goes somewhere that dogs or other critters can get to it, they may get poisoned. If it goes down a drain or is collected and recycled no problem. I have never heard of any type of antifreeze reacting with ag sprays, certainly not in the small amounts left after the sprayer is washed out. Well, my Niedzwetzkyana apple is in full bloom…and first king bloom started opening on Granny Smith’s. Guess spring has arrived. No more 60s in the weekend forecast. Also no 24 hour periods with temps above freezing and no rain in the 10 day forecast. My dormant oil/copper spray will have to wait. And my dormant oil didn’t get done…too busy on the warm days, and too cold on the other days. Couple of apple trees blooming already. Niedzwetzkyana and Granny Smith. Heavy frost on the ground and on trees. I expect I lost 75% or more of my peaches. On my mature trees I will start cutting out the ones that don’t produce when frosts occur - likely Elegant lady, Crimson Rocket, and two unknown peach trees that were supposed to be Hale Haven and Belle of Georgia. Still showing mid/upper 60Fs here but not sure how dry it stays. In my strawberry bed i noticed a lot of new growth moving. Its a raised bed and always warms the first. Also noticing grass starting to green up in south facing locations. Newest GFS looks even wetter for the weekend…warm rain but not going to hit any 70F with clouds and rain around. Should get things greening some though. Noticed a tulip out of the ground…1st one. Rabbit will probably eat it. Should be spring like weekend…mid/upper 60Fs with some rain chances…hopefully just overnight sat… Sun a tad cooler around here but still mild… Monday could be the warmest of the 3 with the gfs hinting at 70Fs… after that…its back to much cooler temps. Looks like freeze chances late next week…but nothing is blooming or even moving here so no worries…will probably have to cover some of veggies. Been in the 70s the last few days, was supposed to get some heavy rain this morning, but it wasn’t that bad, the ground looks pretty good. So, guess it’s good enough for me to get out there and change the water pump on the Jeep today being that it’s cloudy and about 60. Hope we can continue to stay above freezing for a while, but it’s almost a given we will get a hard freeze sometime in April.